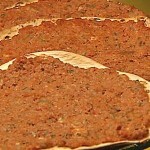 Lahmajoun is an Armenian food recipe for thin crust pizza topped with meat. Mix dough ingredients together adding enough extra flour, if necessary, to make a soft pliable dough. Knead for about 5 minutes to make it smooth and non-sticky. Turn into greased bowl, cover, and let rise until double, about 1 hour. Punch down and divide into 12 equal pieces, each slightly under 2 oz. Shape into balls, arrange about 2 inches apart, cover with plastic wrap, and let rest about 20 minutes. Meanwhile, preheat oven to 450F with rack on lowest level, and prepare topping. Drain tomatoes and finely chop the pulp. Add pulp to remaining topping ingredients and mix with a fork until completely blended. Divide meat mixture into 12 portions of about ⅓ cup each. Take 2 pieces of dough and roll each to an 8 inch circle (dough will be very thin). 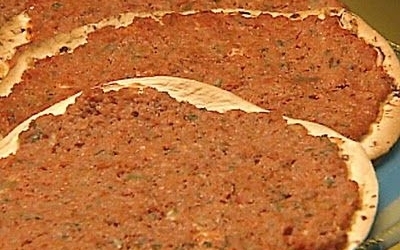 Place them slightly apart on ungreased lipped baking sheet lined with either parchment or a silicon baking pad. Using a fork, spread meat mixture evenly to edges of dough. Bake one sheet at a time for 10 to 12 minutes until lightly browned on the bottom but still capable of being folded. Remove and cool on racks. Repeat until all are baked.